I called in to schedule an appointment after finding this place on Yelp and taking a look at their packages online. Tony is great and helped me out even before I got to the shop, as I had some trouble finding the right suite. He had me sign some paperwork and we took a look at my 2015 Honda Civic together to see what he could help me with. I went with the Upholstery Express for ~$80 since my main goal was to remove some coffee stains from the passenger seat. Tony was very up front with me about the stains and let me know it would be hard to completely remove coffee stains in particular. I was willing to get even minor improvements so I decided to go for it, and I'm glad I did! Although some of the stains are still faintly visible, it is definitely much better now. I waited at the shop the whole time, and they have a very nice waiting lounge with snacks, drinks, and even Netflix! I will definitely come back for any future details. Santos is amazing! I wouldn't trust my car with anyone else in this business, they actually take their time and care about your car. My car was in bad shape and it was still new, I neglected waxing and detailing. They explained everything here about how the clay and wax process works, learned a lot! I got a full detail inside and out. It is seriously in better shape than brand new after what these guys did! I will be coming here regularly and recommending all my friends and Uber Drivers! Santos, the owner, was very courteous and understanding. I was originally quoted around 1-2 hours for my car be worked on. Which I was totally okay with it. They finished my car in about 30 minutes and it looks amazing. I got that car about a month ago and it looked even better than when I first bought the car. I will definitely referring family and friends over to you guys! Their first location was in Brea and I've followed it all the way to their current location in Yorba Linda. It's about half an hour from where I live but every time I've brought my car here I've been more than satisfied with the final outcome. They not only do a great job on your car but have competitive prices which makes the services affordable for even students like myself. There's different packages based on what your vehicle needs; how long has it been since you washed your car, what type and how much damage is already on the car, etc. The more thorough details will take time simply because that's the nature of auto detailing. If you live nearby you can just drop your car off or have someone pick you up. They have a really comfortable waiting room with a TV with Netflix and other services that can keep you company. I personally just bring my laptop and do some homework on the couches and watch Netflix to pass the time. I just bought a used 2016 car that had been a rental- the outside wasn't washed with the proper tools and was covered in scratches. I purchased a Groupon for the Express Wax and added the Clay wax that was suggested to remove the blemishes. The process took 1.5 hours, which their website quotes a 2 hour window, and she came out GLEAMING!! My car looks like it just came off the line! So pleased with this company, pricing, and results. I'll definitely be coming back to keep my car is shape. There's a nice waiting room with coffee too. I bought a groupon for their platinum detail because I wanted a "just as new" car before I started ubering, and Tony was amazing! I accidentally made a reservation for the Placentia location instead of this one, but they were still able to accommodate me. When I came in, my car was dirty, scratched up, and filled with stains and dog hair. Now, it looks as if I got it out of the dealership! Tony was hardworking, courteous, and super accommodating. My experience was awesome as a first-timer and he exceeded my expectations. Thank you again, Tony! Everyone was so friendly and nice. Contacted the company about an appointment for detailing. The owner Santos called me in less then 10 mins. I let him know what I wanted done. He suggested I come same day because they were not busy due ti cancellation instead.of waiting til weekend. I took my truck after work and I worked with Brandon. Brandon was such a nice guy and we discussed what my truck needed. He gave suggestions and was not pushy. He is cute also girls. Anyway, my main focus was the interior detailing / leather....it came out great. I brought them a challenge and Brandon and the other guys did a great job. I sat in lounge watching netflix while having some of their snacks. Professional place and great atmosphere. Also chatted with another owner ..her name escapes me but she was so cool and showed me some work she had done there. I pay for great service so I can't tell you if they are higher than other places...my first thorough detail job. Took my car in to get it detailed and I was very impressed with how it turned out. Can't beat the value, they made my old Honda civic look almost brand new again. Yellowed headlights were turned crystal clear, no residue what so ever. The inside was spotless, and the outside paint never felt so smooth. The appointment process was easy and efficient. They took care of me as soon as I pulled up and even offered a ride to a nearby gym so I could workout while they worked on my car. My car looked great inside and out and would not hesitate to use them again. Very friendly and they did a great job! Customer service awesome. Job was done impeccably. And the food concierge was provided, along with wifi and coffee and snacks. Excellent customer service. Reasonable prices. Extremely accomodating. My car looked like new. Detail experience is customizable and you are given a complete run down on recommendations for your car without being pressured into extra services. Would recommend to anyone hands down. Did an amazing job cleaning my car! Had interior stains that I had never been able to get out and after one time, the stains were out. Great price for the amount of work done. I'm about a month late into writing this review, but let me tell you this: Yorba Linda Elite Auto Detailing has been on my mind everyday!! I gifted their Elite package to a family friend for her birthday. We went in together to drop off her car on a Friday afternoon and were told to come back around 6 pm. She was most worried about getting some of the water/wax (melted birthday candles, the HORROR) off of her seats. Although they couldn't guarantee they could get those stains out, they promised to try their very best. We showed up shy of 6pm to retrieve the car and were so so so shocked because our 2015 Honda Civic looked as good as new. Not only were the stains were a thing of the past...the car was immaculate! It was glistening and totally had that new car "smell" and "feel" again. Every nook and cranny had been cleaned out and "steamed". I jokingly asked them if they had given us new wheels because they look brand-spanking new! Tommy's manner of dealing with customer is superb and I told him I would definitely be bringing my Convertible Mini in next time. I'm sold on them, and I hope you will be too! P.S the snacks and drinks in the front office are definitely enough to tide you over if you're in a pinch! We didn't wait in their waiting room but it looked really clean and comfortable. They did an immaculate job on my car. When I got inside it looked brand new, better than when I first bought the car, when it was actually brand new They are accommodating as well, I really appreciate that they are willing to change things a bit in order to make you happy. Very professional and they did a great job on both my cars!!! I highly recommend this detailing establishment,I haven't taken my cars to other places, but this one by far has been the best! Thanks again. Great service and attention to detail. Helped me with everything I needed and my car looks like new. It does take awhile, but what do you expect? They were working hard in the heat, and my car was A MESS before they got it. They do have a nice waiting area and snacks and drinks though, in case you're like me, waiting it out. Thanks for my detail, I love to be in my car again! The shop is a hidden gem in a business park in a remote area of Yorba Linda. A little inconvenient to get to but don't let that stop you from having your car detailed by them. They did an excellent job on my car compared to a normal car wash place. However expect to drop off your vehicle instead of waiting although they have a comfortable waiting area if you must. Came here to get my baby some TLC and they definitely took care of her! Somehow my car ended up with mold, probably courtesy of my children spilling something, so I bought a Groupon to get it detailed and hopefully get the mold out. When I got there, they explained to me that detailing alone would not rid the car of the mold, and that I would need to get an ozone treatment to completely rid the car of the spores now growing and floating around in my car. I was impressed that they mentioned they were one of the few businesses in the area that even offered the treatment. I ended up getting the ozone treatment, adding on a scotch guard coating for the interior, and redeeming my Groupon. The entire process took the whole day, but let me tell you was it worth it! When my friend brought me back to pick up my car, I didn't even recognize it. Like, so good I almost went back to return the keys thinking "I'm here for the 2013 Mazda 3, not the Maserati ya'll." Haha, ok that's exaggerating, but damn, did it look good. Excellent service, attention to detail and high quality work. 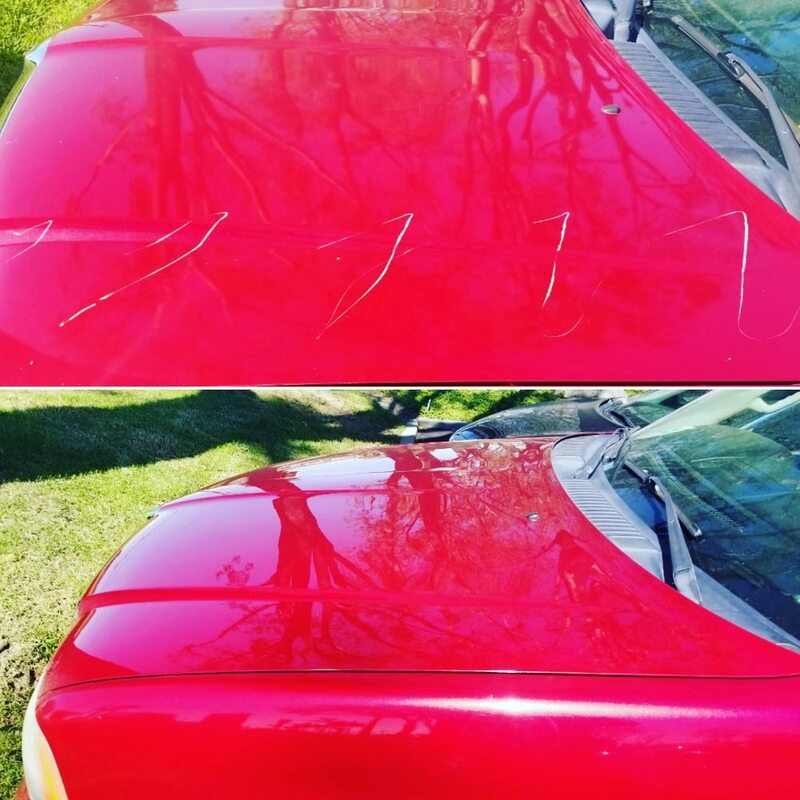 When we weren't fully satisfied with one part of the detailing service, they kept our car and did another pass to make sure we were fully satisfied. They were very communicative with my husband and I, and left us feeling confident in their work. This group knows what they're doing when it comes to car detailing and I highly recommend their services. This place is awesome. They left my car looking like new again. I haven't had my car clean in a little over a month so it was pretty dirty and had a few scratches on the exterior but they took care of that and left my car scratch free and spotless from the interior as well. Will definitely recommend and I will be coming here again soon! Just got home with my Prius! This is definitely my go-to place for all detailing services from now on! Tony was professional and on-point. His recommendations were very honest and he genuinely wants to help the customer make the right decision. I asked him about the ozone deodorizer because I recently had a rodent problem. He said he can't guarantee it will help because it's not meant to treat it. However, he did steam the crap out my car vents and carpets. The car smells great, feels great, and looks great! I will be coming back in a few months for the paint touch-ups and to fix the dent on the rear bumper (yup, they do those too!). I met the co-owner today as well. Her name is Deena (spelling?). She was very sweet. If you are not in a rush and wants to wait for the service, they have a very nice lounge area with snacks and coffee/tea/water (all complimentary!) Deena does a great job of keeping her customer comfortable! My car was disgusting! And I had found a Groupon for these guys, I have never been there before and when I walked in they had the most awesome service. They couldn't find me because I had actually missed my appointment the day before mistaking it for that day instead. But they offered me drinks snacks and helped me get rescheduled for a week to two weeks later. When I was able to come and get my car done, they let me sit in their Lounge room on their leather chairs and have some drinks and snack while I waited and watched Netflix! IT WAS SO FAMILY LIKE and i was so relaxed and enjoyed talking to the receptionist there. I forget her name, she may be part owner. She was so heart warming and down to earth. In the business of cars it's hit or miss with getting what you pay for. Sometimes you get deceived and people take advantage of you, other times you get what you pay for, good and bad. At this place you DEFINITELY get what you pay for in a good way! They really know how to take care of you and make you feel special. They give you their undivided attention to what is important to you and your car. I don't remember this time which detail I got but it was kind of the mid higher range off of Groupon. And it was worth every penny! I will definitely be back, I look forward to going back there soon as my car really needs another detail and wash.
Had my car detailed and let me tell you it came out looking better than the day I got it. Fell in love with my car all over again few friends told me to try this place out I'm sold and the customer service is superb they'll go above & beyond for you. Highly recommend to anyone. This past week I brought my Ibis white Audi S5 into YL Elite for a total detail. When I picked up the car later that day I was blown away - as it actually looked better than when it was BRAND NEW! The staff was extremely courteous and answered all my questions in detail. You could see that they take real pride in their work and it really showed. I would suggest anyone looking for a top-notch detail to roll by their shop and talk to them and see the work they do. I had our 2008 Pontiac detailed there and Tony did a GREAT job. It hasn't looked this good in a long time. Tony was very helpful in explaining their process and I was impressed by how much pride he took in getting my car to look as good as possible. I will certainly use them again. Took my Ford Explorer here for the clay wax treatment, and all I can say is that it was worth every penny. Jose really took care of my car. He really made sure he went over the entire process with me and had my car looking like it just arrived on the lot! Santos ensured that my appointment was properly scheduled and continues to offer great deals, compared to the other detailing businesses out there. Although this place might be new, their staff have worked in the business for many years. Now I've read some of the bad reviews and I can completely understand how some of the customers felt. However, my experience has been completely different. Whenever I have called to make an appointment, I have always been helped right away and given a direct answer. Should you arrive at the office and there's no one inside, just knock on the door closest to the garage! It's most likely there's only one person working at the office and they keep the door closed to make sure the customers, who are waiting, don't hear all the background noise when we are comfortably watching television (they offer free Netflix by the way) or trying to make a phone call. Like today, Jose was the only one in the office, but when someone came in, he helped him right away and apologized to me for the delay. Sometimes, you'll find some portions of the car not to your definition of perfection. I've encountered this many times in many other places. Just remember, the people working here are human just like you. Whenever I've seen something that was possibly missed, I simply pointed it out and they took care of it right away! Once again, every person's experience is different, but this place is by far the best around in, and in close proximity to, Yorba Linda. So in a nutshell, if you're in or around Yorba Linda, try this place out! See how your experience is and I'm sure it'll be as great as mine was. And get the clay treatment - the exterior of my car (every single spot I touched) was extremely smooth and clean! They did such a thorough job on steam cleaning my engine, restoring my headlights and the interior of my van. I was pleasantly surprised when I saw the outside so clean as well. An added bonus. The staff are so happy and really do care about your vehicle. Very reasonably priced as well. Had an unfortunate event on a ride share platform, the car had been trashed on the inside and filled with smoke. Elite picked up the car, had it for 5 hours, and dropped it off in like new condition. They did an amazing job and would highly recommend. Not only did my car look and feel brand new but the customer service at this shop was exemplary. They took me through step by step all they were going to do my car and just through how they handle the vehicle you can tell that they care about each and every individual job they perform. Highly recommended. Had a great experience with them. Had some pretty deep scratches on my black truck which I really wanted to get rid of. They got rid of the scratches and detailed my truck. They left it better than new! Thank you guys! I received a flier about a couple months back and decided to give them a try on my Buick Enclave. Initially, I thought their car wash prices were a bit on the high side as local car washes are about $20. As any car washes, outside looked good. But the inside job was what AMAZED me. It wasn't a simple vacuum and clean the windows. They actually take the time to CLEAN the interior. It was as if I had gotten a semi-detailed option at one of the local car washes. Now I understand why they say each car washes can take anywhere from an hour or more. I hate waiting as much as the next guy, but when they are spending the time to clean/detail my vehicle, it is definitely worth the wait. Came here last Saturday and I'm totally loving the job they did on my car!! I love the cleanliness, shine, the smell, all of the love they put into my car to make it honestly look brand new :). I have an older car (2009) when they were done with it, it shined so bright and the inside was so throughly cleaned it left me a very happy customer. I highly recommend them! Super friendly and easy to make an appt with... I did their premium package and it was worth every penny. Santos and his team are AMAZING!!! My son got "sick" in my brand new car (less than 2 mos. old)! And I have leather seats with pin hole design for the heated/air conditioned seats. Needless to say that the "mess" went into these holes and into the seats as well as all over the carpet and floor mats. The smell was over bearing and I cried thinking that NOTHING or NO ONE would be able to help. The team at Yorba Linda Elite not only responded to my email ASAP - but they were very helpful in educating me on the difference in detail companies especially when dealing with this kind of "mess". They got my car in right away and made it like new!!! They also did a great job washing and detailing it inside and out - so when I picked it up - it was like new!! If you're looking a professional, reliable and honest detail shop for your vehicles - you DEF want to take it here!! Call us today and book your appointment. It’s “Hassle Free” and with 23 years of experience you can rest assured your vehicle will look it’s best in no time.